The Board affirmed a refusal to register the trade dress shown below, for “recycling collection center services for collecting clothing and textile goods for redistribution to further users,” finding that the proposed mark comprised a nondistinctive design lacking in acquired distinctiveness. Applicant’s reliance on Section 2(f) was a concession that the trade dress is not inherently distinctive. In re St. Pauly Textile, Inc., Serial No. 85769111 (June 7, 2016) [not precedential]. The mark, according to applicant, consists of a three-dimensional depiction of a drop off station in the form of a “decorative residential garden shed.” The shape of the deposit opening (shown in dashed line) does not form part of the mark. 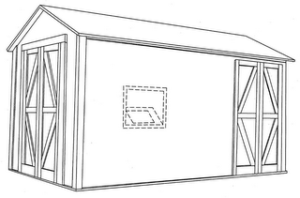 Applicant argued that the evidence was sufficient to establish a prima facie case of acquired distinctiveness, contending that applicant “appears to be the sole user of a residential garden shed for recycling collection center services.” Accordingly, applicant asserted, a lower amount of evidence should be needed to establish acquired distinctiveness here. Given the nature of applicant’s proposed mark, the Board found that a higher level of evidence is needed to establish a prima facie case of acquired distinctiveness. Applicant’s eighteen years of use was insufficient, in itself, to meet the requirement. The evidence regarding expansion of use of applicant’s drop box may show only that its services are becoming increasingly popular, not that consumers perceive the shed design as a source indicator. Applicant’s supposed “look for” advertising simply says to look for its shed, but does not reference the design at issue. 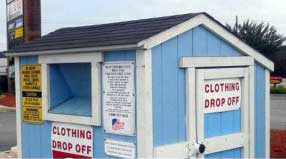 Thus customers could perceive this statement as saying “look for our donation drop off.” Similarly, the media refers to the drop off as a shed, with no mention of the applied-for design as identifying source. Accordingly, based on all the evidence, the Board found that applicant had failed to establish that its applied-for design has acquired secondary meaning. And so the Board affirmed the refusal. Text Copyright John L. Welch 2016. TTAB Test: Which of these Three Section 2(d) Refusals Was Reversed?